As per usual, the West Hollywood Halloween Carnaval will draw a huge and freaky crowd Friday night (we mean that as a compliment!). That means the street closures shown above will be in effect and a few Metro Bus Lines — the 2, 4, 10, 30, 105, 704 and 705 — will detour around the Carnaval. Another reminder for those attending Halloween events throughout Los Angeles County: as per usual on the weekends, Metro Rail and the Orange Line and Silver Line will be running until 2 a.m. both Friday and Saturday night. Maps and timetables are here. Please consider taking transit, a taxi, ride-sharing or using a designated driver if you plan on celebrating (or over-celebrating) the holiday/weekend. 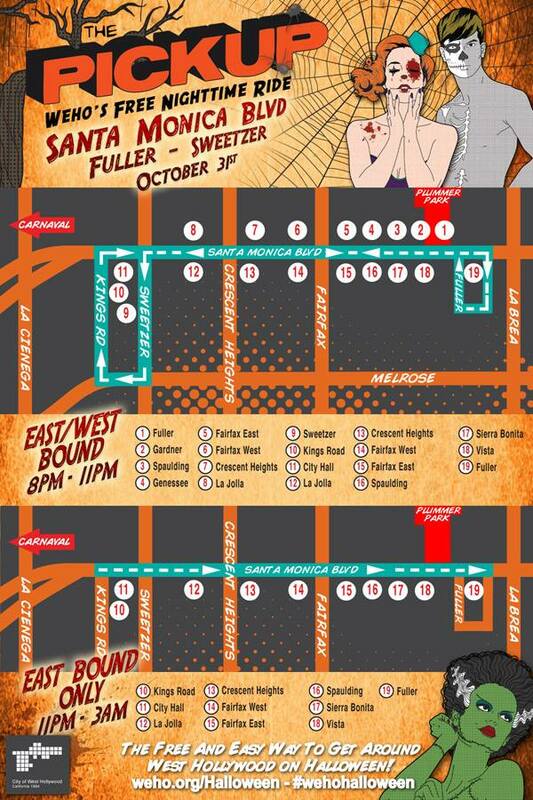 Specific line-by-line detour info is here for the WeHo Halloween Carnaval. Please note that you can use all the above buses to reach the Carnaval, although there is some walking involved between bus stops and the Carnaval. If you are taking the 4 Bus or 704 Bus that runs on Santa Monica Boulevard, the eastbound detour begins at Santa Monica Boulevard and Beverly Drive — a half-mile walk to the beginning of the Carnaval. 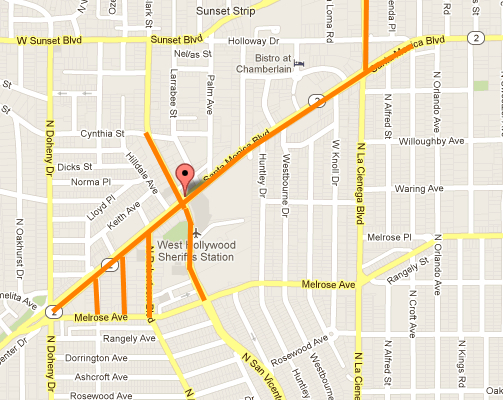 The westbound detour begins at Santa Monica and Fairfax — a .7-mile walk to the start of the Carnaval. The city of West Hollywood is also running its trolley on the east side of the closures — the trolley will get you close to the start of the Carnaval. The signs posted at the stops I believe are incorrect. They state the buses on Santa Monica Bl. will start to detour at 12 midnight. I believe Santa Monica Bl. will not be closed until 12 noon. I drove Line 4 prior to the Halloween celebrations in the early 1980’s. We actually had to drive very slowly starting around San Vicente Bl. due to a few people celebrating in the street. It would be great if next time West Hollywood has a major festival, the #30 bus connecting West Hollywood to downtown and East LA would make full trips each time. On the night of the festival, half the busses turned around before reaching the carnival. The busses were full, there’s definitely demand.